2010 was, in the language of pilgrims, a Holy Year. They don’t come around all that often and when they do, the Cathedral of Santiago de Compostela greets many thousands more visitors than in an ordinary year. I had read about holy years for some time and thought it was really nice to have a special celebration just because the Feast of St. James falls on a Sunday in that particular year. The next one will be in 2021. I was working in my office, catching up on world news over lunch at my desk, when I saw a post from someplace saying that Spain was getting ready to close out the Holy Year with some festivities and the formal closing of the Puerta Santa – the side door entrance to the main body of the Cathedral that is only open during holy years. I sat there for a minute, imagining being there for this event, wondering what kind of ecclesiastical celebrations were in store, and I started looking at my calendar. That was when I started my pilgrimage. Since I worked at a university at the time, the winter break holidays were coming up; there were easy days to take off, four work holidays, lots of closings – in other words, lots of not much going on. Then I looked at one of the pilgrimage websites to see what the requirements were to receive the Compostela, the formal document from the church saying you completed the pilgrimage, the Camino. If I were to walk just the last 100 km., I would be eligible, and it looked like I could do it in just five days walking. Then, I needed to scope out buying the airfare – which, at that time of year, is kind of tricky. Travel on one day is expensive, leave the next and the fare drops or sky rockets, depending on where the actual holidays fall. I figured that the majority of my own holiday would be celebrated on Christmas Eve, leaving the next day for my trip to Spain. If I flew out of NYC on Christmas Day, I would arrive in Madrid the following morning. 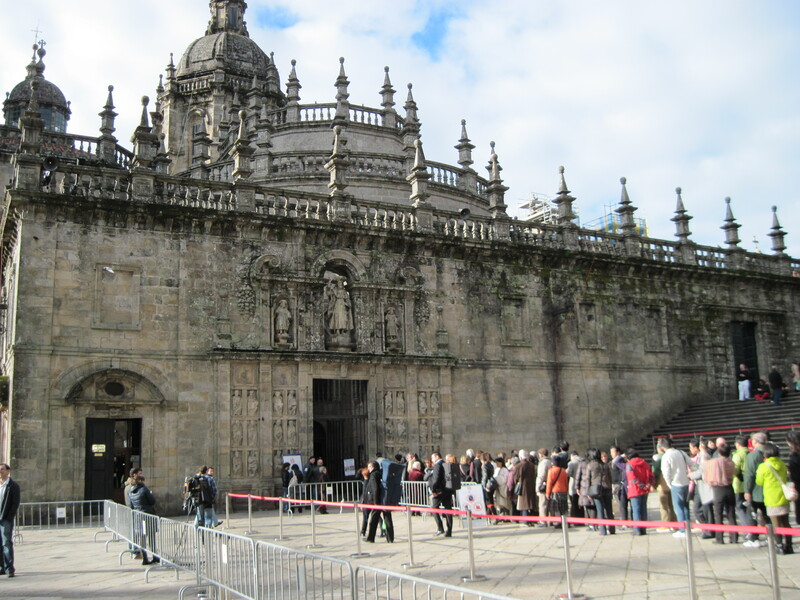 I could take a bus to Sarria, my starting point in Galicia, and start walking to the Cathedral on December 27 – which would make my arrival in Santiago de Compostela New Year’s Eve. It was cutting it close, but I was convinced I could do it. And I was going to do it by myself. Then, I announced my intentions to my coworkers. Two out of three cheered and wished me well, saying how they knew I had wanted to do this again and that all would be well. But it was the third – an undergraduate work-study student – who gave me what I needed. With their encouragement and some quizzical looks from my family, I bought the ticket, researched bus routes, booked a hotel in Sarria for one night, and started packing my backpack. I had boots and my dad bought me a new winter jacket. He told me later he wished he’d bought me a hot pink one instead of grey and black so I’d be safer walking along highways. I packed my seashell from my 2009 trip with my son, wished my family a Merry Christmas and left for the airport. Waiting for the same flight to Madrid from JFK was a woman who kept looking over at me. I was waiting for the boarding call when she came over and asked if I were a pilgrim, that she recognized the gear, or lack thereof, and wondered if I were going to Santiago. 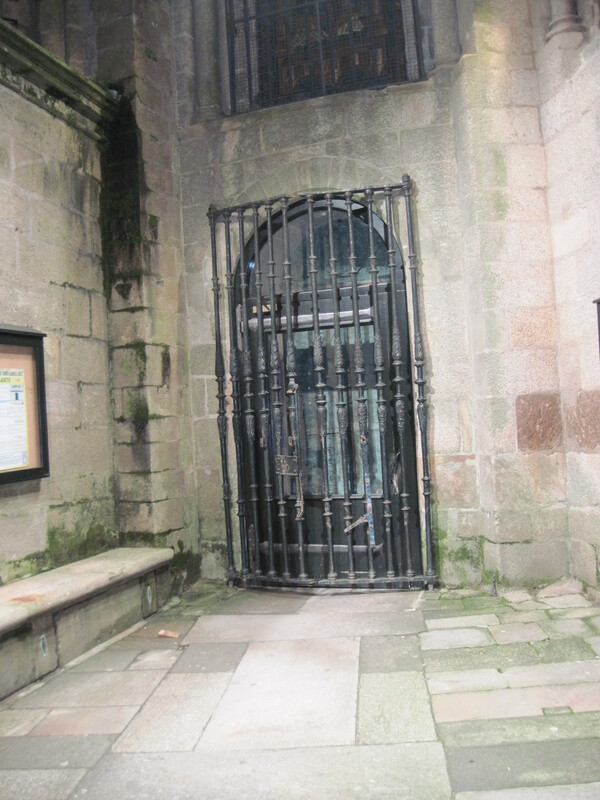 She said she was a “Camino Junkie,” looking for any excuse to go, to walk, to learn more about the medieval routes, to compare notes with other junkies, and she teared up when I told her I was heading to Sarria to be able to walk through the Holy Door before it closed. While we were waiting, the flight desk personnel made an announcement that our flight was overbooked and if anyone could leave the next day, they would be rewarded with first class seats. I had a seat assignment on my boarding pass so I ignored them – and if I waited even a single day, my whole plan would have fallen apart. Which is lucky because December 26, 2010 was a fateful day in NYC weather. We got 20 inches of snow and absolutely nothing was leaving for Spain or anywhere else. When we landed in Madrid the following morning, she wished me a “Buen Camino!” and I took a cab to the bus station to connect with a bus to Lugo, then on to Sarria. While I was waiting for my bus to come in, I bought a knit hat and a scarf in one of the little shops. The hat was hilarious – it must have been a Chinese import. Instead of the word Thinsulate on the logo, the hat read “Thinsuke.” But it worked and the scarf still reminds me of that bus station and how terribly cold I was waiting for the bus. When I changed buses in Lugo, panic set in – big time. I convinced myself there must have been more than one Sarria, that I was in the wrong place, that the bus to Sarria would never show up, that I was going to have to scrap my plans, and that the ham sandwich I ate there was going to give me the dreaded collywobbles. I could not have been more wrong. Pilgrims started assembling in the station and just a few minutes later the bus to Sarria arrived and we were on our way. I did have a map. But finding the hotel was a challenge. I stopped two older women and asked them how to get to the hotel and they just criticized my Spanish. They asked me if I knew any other languages with which to ask my “Donde esta el Hotel Alfonso IX?” I accommodated them with English, French, and Italian, just to be nice, and they sent me down along the river to look for a bridge – never once indicating that, in fact, at that precise location on this planet, I could have seen the hotel across the river. I checked in and got some sleep. The next morning, I headed down to the lobby cafe for breakfast, and got my first stamp on my pilgrim’s passport from the very nice lady at the front desk. She warned me that daylight would not be for another hour and that it could be dangerous walking at that early hour. Never known for a reckless streak, I ignored her and wished her a lovely day. 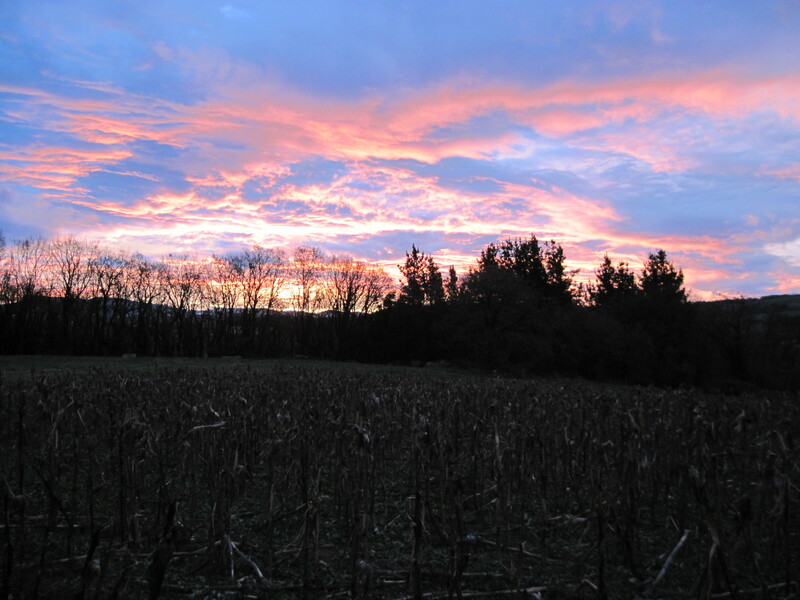 It was dark immediately after leaving town, but once I got out into the countryside, I had a 360 degree view of one of the most spectacular sunrises I have ever known. Posted in Camino Frances. Tagged Camino, New York, pilgrim, Sarria. Next: Next post: What is an Amigo? Oooh! I’m addicted to your blog already! This was an awesome post about your flight a d travel logistics. So glad you didn’t delay and get stuck with that NYC blizzard! 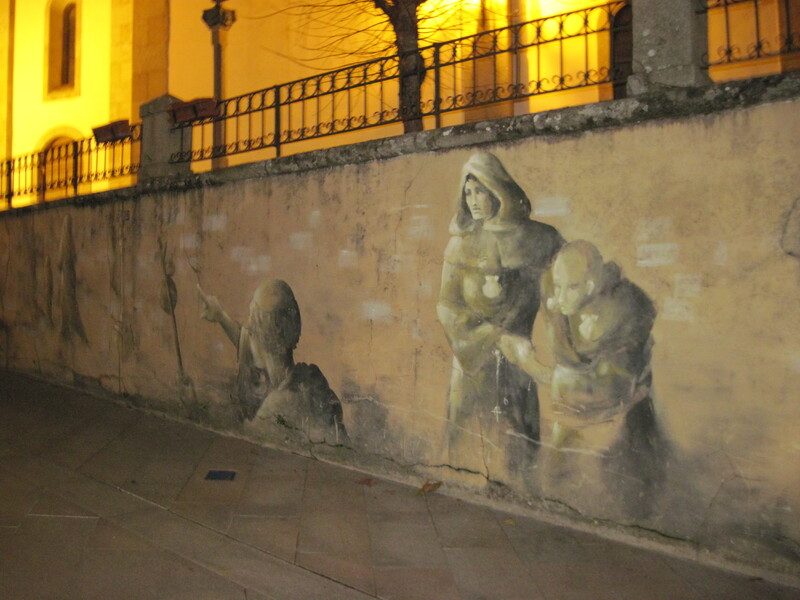 Your first Camino miracle for sure! You know, you’re probably right.